1. You can put your files/attachments for users to download. The links that points to your downloadable resource would belong to your own domain. 2. Sometime we want to show working example of code. For example you may want to attach a running JSP/Servlet page. With Blogger and Wordpress, it is not possible. So what you can do is, put your dynamic resources in sub domain. So how to configure sub domain? You just need to put an A RECORD entry into your blog DNS. And configure the sub domain under Tomcat or Apache. Configure Sub Domain That Points to Another Host from Asif Shahzad on Vimeo. Here is what I put in my Tomcat configuration. I have a blog on blogger too, custom domain under godaddy www.packagingoftheworld.com. I would like to point directory.packagingoftheworld.com to another server hosted with hostgator,what should i do? 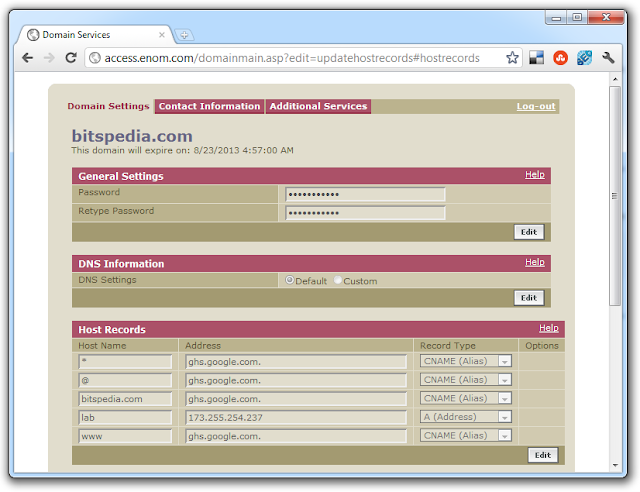 You need to add A-Record into your DNS settings. But I can understand, it may be difficult to do first time. So ... I see your registrar is GoDaddy, I have made a demonstration for you. See the video I have added above.